For the community in Tennessee, see Rogersville, Tennessee. 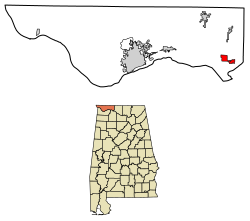 Location of Rogersville in Lauderdale County, Alabama. Rogersville is located at 34°49′24″N 87°17′8″W﻿ / ﻿34.82333°N 87.28556°W﻿ / 34.82333; -87.28556 (34.823444, -87.285693). According to the U.S. Census Bureau, the town has a total area of 3.1 square miles (8.0 km2), all land. As of the census of 2000, there were 1,199 people, 536 households, and 361 families residing in the town. The population density was 389.6 people per square mile (150.3/km²). There were 604 housing units at an average density of 196.3 per square mile (75.7/km²). The racial makeup of the town was 93.08% White, 5.67% Black or African American, 0.17% Native American, 0.42% Asian, 0.08% from other races, and 0.58% from two or more races. 0.42% of the population were Hispanic or Latino of any race. There were 536 households out of which 26.1% had children under the age of 18 living with them, 51.1% were married couples living together, 12.9% had a female householder with no husband present, and 32.5% were non-families. 31.2% of all households were made up of individuals and 19.0% had someone living alone who was 65 years of age or older. The average household size was 2.24 and the average family size was 2.79. In the town, the population was spread out with 22.2% under the age of 18, 7.3% from 18 to 24, 24.7% from 25 to 44, 24.4% from 45 to 64, and 21.4% who were 65 years of age or older. The median age was 42 years. For every 100 females, there were 83.6 males. For every 100 females age 18 and over, there were 79.8 males. The median income for a household in the town was $29,779, and the median income for a family was $37,639. Males had a median income of $30,852 versus $18,571 for females. The per capita income for the town was $16,435. About 10.2% of families and 14.3% of the population were below the poverty line, including 19.2% of those under age 18 and 15.7% of those age 65 or over. As of the census of 2010, there were 1,257 people, 555 households, and 342 families residing in the town. The population density was 405.5 people per square mile (157.1/km²). There were 639 housing units at an average density of 206.1 per square mile (79.9/km²). The racial makeup of the town was 91.2% White, 6.1% Black or African American, 1.0% Native American, 0.6% Asian, 0.2% from other races, and 0.8% from two or more races. 1.7% of the population were Hispanic or Latino of any race. There were 555 households out of which 24.7% had children under the age of 18 living with them, 44.3% were married couples living together, 13.2% had a female householder with no husband present, and 38.4% were non-families. 34.6% of all households were made up of individuals and 18.9% had someone living alone who was 65 years of age or older. The average household size was 2.26 and the average family size was 2.94. In the town, the population was spread out with 22.1% under the age of 18, 7.5% from 18 to 24, 23.4% from 25 to 44, 25.1% from 45 to 64, and 22.0% who were 65 years of age or older. The median age was 43 years. For every 100 females, there were 87.9 males. For every 100 females age 18 and over, there were 92.6 males. The median income for a household in the town was $32,727, and the median income for a family was $44,803. Males had a median income of $44,219 versus $38,229 for females. The per capita income for the town was $19,605. About 12.2% of families and 12.8% of the population were below the poverty line, including 12.5% of those under age 18 and 10.8% of those age 65 or over. Norman Tellous Cooper - (1913 - 1994)- AL Sports Hall of Fame - Coached football at Howard College, Vanderbilt, Kansas and LSU - former professional football player - 1933 graduated from Lauderdale County High School, Rogersville, AL; 1937 graduated with B.S. from Howard College, Birmingham, AL; 1941 graduated with M.A. from Peabody College for Teachers, Nashville, TN - brother of Ken Cooper—Norman's nicknames "Archie", "Slim" , "Shorty"
^ "American FactFinder". United States Census Bureau. Retrieved 2015-07-30. This page was last edited on 1 April 2019, at 23:54 (UTC).